For me it began as a kid. I would clip a baseball card to my bicycle so it would click against the spokes simulating what I imagined was the sound of a motorcycle. I bought my first new motorcycle in 1973 at the age of 21. My parents were adamantly against the purchase and refused to co-sign a loan for me. A friend from high school, and her husband, agreed to take the risk...and I was off and running on two wheels. Since then, we've owned a few bikes and logged more miles than we can recall. Upon bidding farewell to the work-a-day world at the end of the 20th century, Juju and I have been back and forth across this country several times. We've been to all 50 States, the District of Columbia and Puerto Rico...much of it in an RV with the bikes. On several of these trips, Ed and Nancy were right there with us to share the sights and stories along the way. We often talked about those "someday" trips. Frequently, the discussion was about riding Route 66: the Mother Road. A few months ago, our conversation about this "someday" ride centered around the statement "Ya know, we're not getting any younger, so if we're going to do it, let's do it now." Very little arm twisting was required and the planning began. Having ridden several segments of Route 66, we always wanted to say we rode it from end to end (Santa Monica, California to Chicago, Illinois). During one of our travels out west with Ed, Nancy and a few other members of our little HARP group, we experienced riding a section of U.S. Route 50 through Nevada. Route 50 cuts across the country passing through 12 States and the District of Columbia, as it makes its way between Ocean City, Maryland and Sacramento, California. In the late 1980's Time Magazine devoted an entire issue to this road calling it the "Backbone of America". 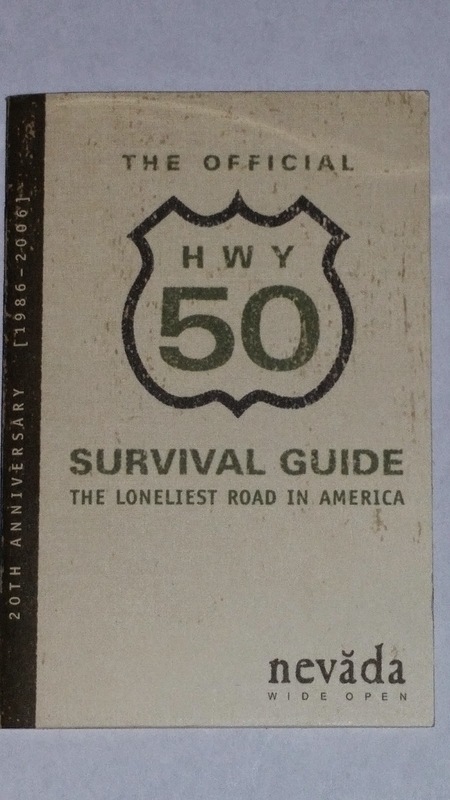 A less than flattering article in that issue named the segment in Nevada "The Loneliest Road in America". We found the road to be quite the opposite. Granted, there is very little civilization; just a smattering of small towns where you can get gas, food and a cool drink. But there was an obvious peace and visual beauty along it. Not much to get in your way...no obstructions...no restrictions. It was at this point, riding Route 66 became entwined with riding Route 50. Then, the Pacific Coast Highway became the perfect way to link the two roads. It's often been said that riding a motorcycle is the closest you can get to flying without leaving the ground...Here's what I think...only someone who rides understands why a dog sticks his head out of the car window. I will attempt to write a little something as often as possible as we embark on this nearly 7,000 mile ride across the country. I hope you enjoy it, and your comments (at least the appropriate ones) are always welcome.